In “Give Us A King 3” I suggested that the way Yehovah chooses his king is by anointing them! And then the mashiach king (meh’-lek hamashiach), the anointed king rules according to Yehovah’s statutes, ordinances and judgments. The mashiach king (meh’-lek hamashiach) is in the place of Yehovah; those men whom he rules over call him “adoni or my master” and he, the mashiach king, calls Yehovah “adoni.” Remember, the people are going to be His servants. The Mashiach king, chosen by Yehovah, follows Him, the people (men) follow their king and all the women each follow their man. The first king that Yehovah told Samuel to anoint was Saul, a giant of a man; he was head and shoulders above all the men of Israel. I think it is interesting that Yehovah called Saul a commander [נגיד, naw-gheed] and not a king [מלך, mel’-lek]. Now Yehovah made His choice known publicly. So we did, and the tribe of Benjamin was chosen. Then the house of Matri and then Saul, the son of Kish was chosen. This sounds like they may have drawn lots to arrive at Yehovah’s choice. Amazingly, it was Saul, the same man whom Yehovah had chosen as His mashiach king privately. I think Yehovah did this private and public ceremony for Samuel’s peace of mind. When Yehovah makes His choice and anoints His man, there is no doubt in anybody’s mind whom He has chosen. As I said earlier Saul, the man of the flesh who was head and shoulders above all the men of Israel, seems to be a shadow picture of an “anti-mashiach”. Men or men whom He chose for His purpose who would not follow His ways. David, however, is a man of the spirit. This time Yehovah decided to choose and anoint a king [מלך, mel’-lek] and not a commander [נגיד, naw-gheed]. When he arrives, Samuel assumes that Eliab (the eldest, tallest and strongest of Jesse’s sons) is the one whom he should anoint in the presence of the elders of Bethlehem. After all, he is the big guy just like Saul was. But this time Yehovah says that He does not look at the flesh, as men do, He looks at the heart. So all the sons of Jesse were brought to Samuel, but Yehovah had not chosen any of them. 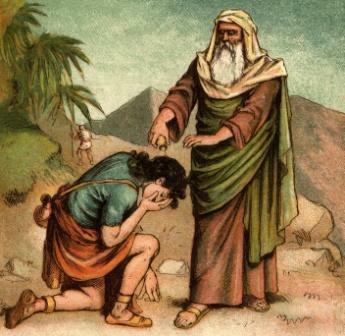 Finally, David is brought to him and Samuel makes him the mashiach king (the hamashiach meh’-lek). Well, in time (because of the incident with Goliath and many other mighty deeds of David) all the elders of Judah and later all the elders of all Israel acknowledged Yehovah choice and again anointed David as their king publicly. Next time we will see the circumstances behind how Solomon became the anointed king (the hamashiach meh’-lek) and how sometimes Yehovah even has a foreign king anointed to do His good purpose.